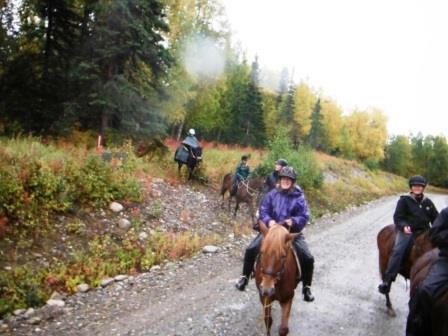 The competitive trail ride, or CTR as it is called, is going to take place this year in Fairbanks. It alternates years with Southcentral Alaska. Last year, Pete was the ride manager/organizer. This year it is Laurie Knuutila’s job. She’s been organizing the Fairbanks ride for at least a dozen years. The question that we have been tossing back and forth, endlessly, is are we going this year or not? The first problem is that Hrimmi, age 5, is still very young and we think, not quite ready physically or mentally. Physically, she’s a bulky gal, and so it is difficult keeping her moving. She stops a lot too. And mentally, she’s really still just a baby. The second problem is that Tinni, age 28, is getting along in years, and perhaps no longer ready mentally or physically. Raudi, age 14, is very ready. So we have deliberated ad nauseum about what to do. Yesterday we took Hrimmi on a group ride and she did okay, though she stopped several times. Pete’s verdict was that she’s close, but not ready to do one eighteen and one twenty five mile day. And today we took Tinni and Raudi both on a longer trail ride, in order to see if he is up for the task. We first went to Grizzly Camp and points beyond. Then we came downhill and turned right as opposed to the homeward direction of left. We went a short ways but it was boggy so we turned back in the direction of home. On the way home we went off trail, turning left, up to the bench. It was a little slick, which made me a bit nervous. And Raudi did once come down on her knees and scared me. I got off her back and checked them. At both Grizzly Camp and at the top of the bench, we checked Tinni and Raudi’s pulse and respiration. The horses were fairly cooperative – I have been experimenting with Raudi –working on standing still the ten minutes before her pulse is taken. Pete today noted that her heart rate drops when she’s given grass, so this is a possible strategy for me to do. Going down the bench trail is tricky – Raudi and I hung behind Pete and Tinni, keeping an acceptable distance way. After, we went to our trails and rode Siggi’s loop. This also went really well – and both the horses and the dog cooperated. We finished up our ride with a quick dash down Raudi’s racetrack. And for me the grand finale was my backing her down a small but steep hill into the creek next to the road. Point blank: The CTR is good for us because if we did not plan on doing it we would not ride the horses as much. For this I am very appreciative. Raudi and I have come such a long ways since 2010. Sometimes it really does boggle the mind. No, you don’t make friends by sitting home alone and thinking – what if I did this?